Background Adult patients who are immobilized, mechanically ventilated (MV) and/or sedated for a prolonged period of time experience decreased quality of life, muscle atrophy, impaired cardiopulmonary endurance, and impaired mobility. Similar research in pediatric population is limited. Methods Baseline data collected September 14, 2015 through December 31, 2015 indicated that 60% of patients were mobilized within the allotted time frame (18 hours for non-MV patients and 48 hours for MV patients) and the average time to mobilization was 20 hours. A survey determined barriers to EM were time, staff, equipment and training. An interdisciplinary team including physical, occupational, respiratory, child life and creative arts therapists, speech language pathology, nurses, physicians, and family advisors worked together to put several interventions into place. An algorithm was created to educate the team on criteria for mobilization, a scheduling system was trialed, and hands on training was initiated. Family advisors are assessing families' knowledge regarding EM benefits and their role in the process in order to incorporate family perspective and feedback. 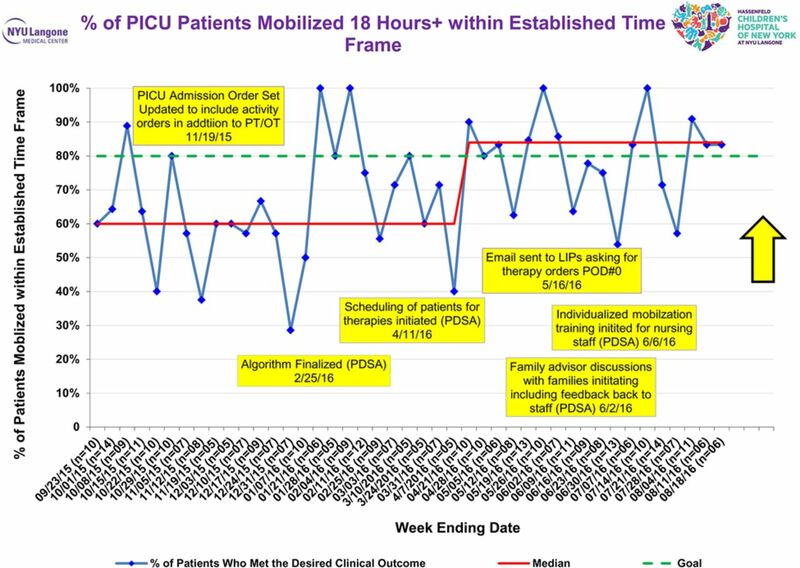 Results The time from PICU admission to mobilization has decreased from 20 to 14 hours and 84% of patient are mobilized within the “allotted” time frame. 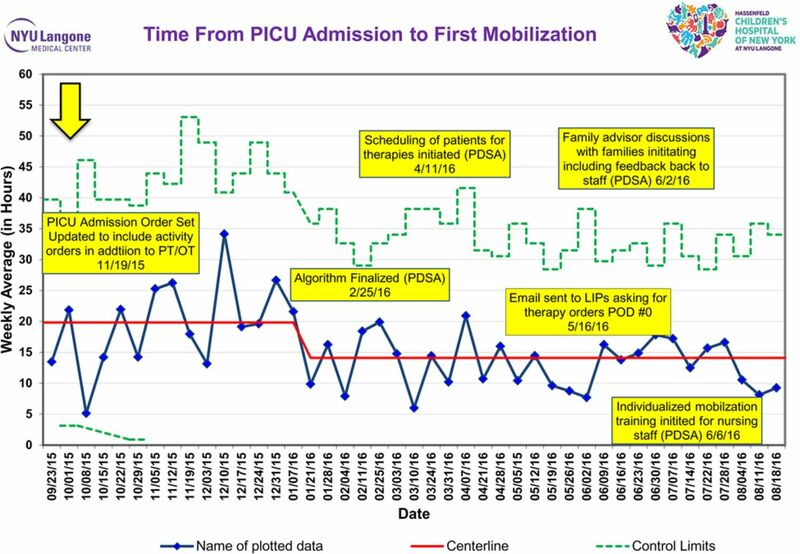 Percent of PICU Patients Mobilized 18 Hours+ within Established Time Frame. Time From PICU Admission to First Mobilization.